Samsung, Oracle and Netflix are among the least green of the global tech firms, a Greenpeace report has claimed. Other weak performers included Amazon, Twitter and Acer, while Google and Apple were ranked among the best. Greenpeace said the IT sector was a major energy consumer and its footprint was growing. "Not surprisingly, it takes a tremendous amount of energy to manufacture and power our devices," it said. The report, which has been published annually since 2009, outlines the energy footprints of large data centre operators and nearly 70 of the most popular websites and apps worldwide. They are then graded from A to F.
Among those given the lowest grade were Twitter and Reddit, both of which had failed to disclose information about their energy usage, Greenpeace said. When contacted by the BBC, Twitter declined to comment while Reddit did not respond to a request for comment. Meanwhile, Amazon and Oracle - both of which had shared information - were given a C and D respectively, while video streaming site Netflix (D) was singled out for special mention. "Netflix has one of the largest data footprints of the companies profiled, accounting for one-third of internet traffic in North America," Greenpeace said a statement. "The company announced in 2015 that it intended to fully offset its carbon footprint, but a closer examination reveals it is likely turning to carbon offsets or unbundled renewable energy credits, which do little to increase renewable energy investment." For the first time, the report evaluated major Asian tech companies, recording poor scores for China's Alibaba (F) and Tencent (F) and Korea's Samsung (D). 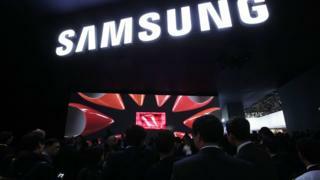 A Samsung representative said it was "acutely aware" of its environmental footprint and "committed to an ongoing programme of lowering our impact on the environment". However, Korean internet services company Naver (C) was praised for being the "first Asian company to commit to 100% renewable energy". "Leading tech companies in the US have shown that clean power can be both good for the environment and for business," said Jude Lee, senior climate and energy campaigner at Greenpeace East Asia. "East Asian companies must step up to embrace that reality as well." According to the report, the IT industry's energy footprint accounted for 7% of global electricity in 2012 - a figure set to grow as global internet traffic increases, exceeding 12% by 2017. Greenpeace said the way "global digital infrastructure" was designed and powered was becoming "central to the question of whether we will be able to transition to renewable energy in time". It said both Apple and Google "continued to lead the sector" in matching their growth with an equivalent or larger supply of renewable energy.